Common Lisp, commonly abbreviated CL, is a dialect of the Lisp programming language, published in ANSI standard document ANSI INCITS 226-1994 (R2004), (formerly X3.226-1994 (R1999)). Developed to standardize the divergent variants of Lisp (though mainly the MacLisp variants) which predated it, it is not an implementation but rather a language specification. 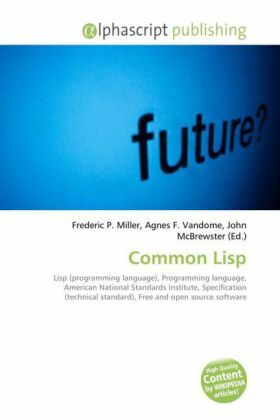 Several implementations of the Common Lisp standard are available, including free and open source software and proprietary products. Common Lisp is a general-purpose, multi-paradigm programming language. It supports a combination of procedural, functional, and object-oriented programming paradigms. As a dynamic programming language, it facilitates evolutionary and incremental software development, with iterative compilation into efficient run-time programs. Common Lisp includes CLOS, an object system that supports multimethods and method combinations. It is extensible through standard features such as Lisp macros (compile-time code rearrangement accomplished by the program itself) and reader macros (extension of syntax to give special meaning to characters reserved for users for this purpose).